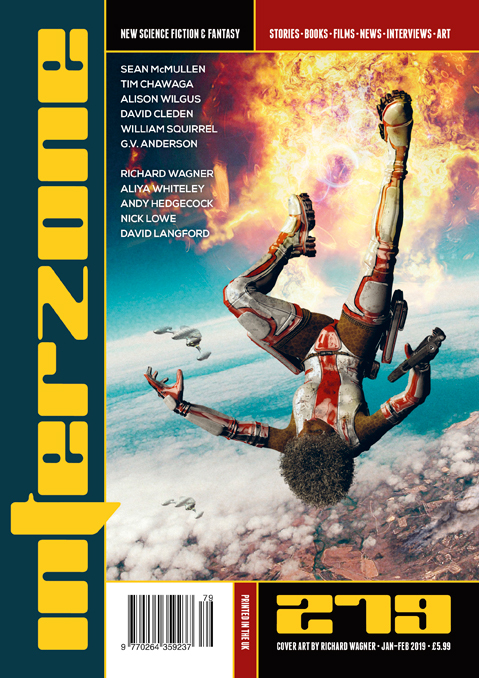 "The Fukinaga Special Chip Job," by Tim Chawaga [bio] (edited by Andy Cox), appeared in Interzone issue 279, published on January 1, 2019 by TTA Press. Pro: The best part of the story is the colorful descriptions of the various floating cities--at least at first. Given the way Pitts mindlessly eats snacks, it’s inevitable that he’ll start eating the Specials, so that adds a bit of tension, since we can see it coming like a train wreck. Because of the lightness of most of the story, it’s shocking at the end to realize the narrator murdered Pitts and left his body in Varuna. Con: The city descriptions go on for too long. There really is no more plot here than “find a box of 80-year-old chips,” and there’s little or no character development.